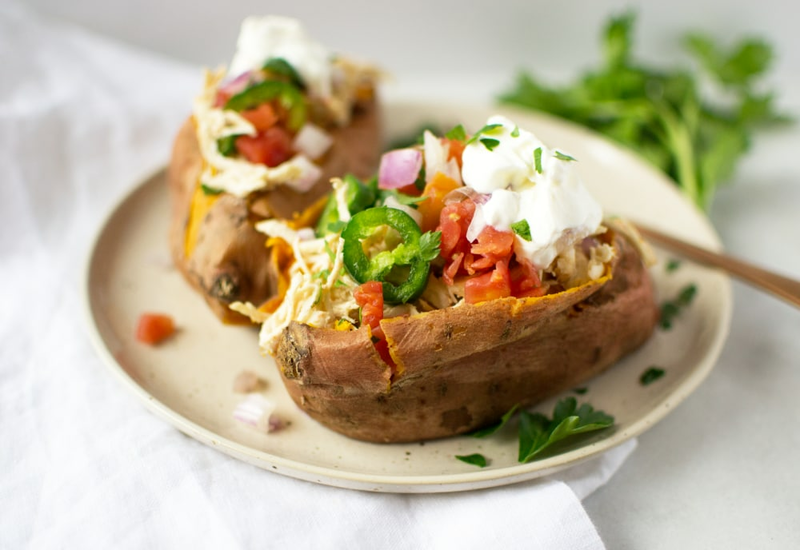 If you like loaded baked potatoes, you will love this flavorful twist! Delicious sweet potatoes are topped with well-seasoned shredded chicken to come together for a perfect weeknight dinner. It’s even better when made in your pressure cooker! Dinner is served in under an hour using the MultiPot. This delicious dish is perfect to customize with your favorite toppings. Try diced tomatoes, chopped jalapeño peppers, sour cream, or whatever tempts your taste buds. Don't forget to pierce the sweet potatoes with a fork before putting them in the pressure cooker. This prevents the potatoes from bursting by allowing the steam to escape from the potato as it cooks. Per Serving: 387 calories; 4g fat; 57.4g carbohydrates; 32g protein; 51mg cholesterol; 148mg sodium. These were really easy to make and tasty! I have such a hard time getting my husband to eat healthy, but he actually really enjoyed this. I would definitely make again. Delicious recipe using one of my favorite ingredients (sweet potatoes). I used to only ever stuff bell peppers, but now this is my new thing. Really good. These are a big hit in my house. I made the sweet potatoes and set up an entire potato bar for people to add their own toppings. So much fun. Who doesn't love a good Mexican dish. I added the black beans to it for some more texture and also topped with some home made pico and guacamole. This is awesome! Recommend it highly and I followed the recipe! First I pressure cooked black beans for the topping! I took this recipe over to the neighbors for dinner but she said it was delish and wasn’t sharing it. It was really great and so time saving!